It’s an online casino, which was launched in 2005 – and during these years, Karamba gained a good reputation. This casino is safe and secured, there are some interesting but rare games here, and the support team is great. Well, these problems are rare and common for many casinos, so we hope they will not make you avoid Karamba casino. This review is created in order to help you understand this casino better and to show the details. Let’s go. Of course, there are no perfect casinos and there are some problems here – the choice of the games isn’t wide, there are no live games with real dealers and the withdrawal can take up to a week. Is this casino safe? Can a player trust Karamba? It’s licensed by Malta Gaming Authority, and it’s one of the most trusted license for online casinos. All the players’ information is protected by the SSL encryption and it means that no one will steal your personal or financial data. What is more, the games at Karamba website are developed by such leading developers as Microgaming, NeoGames, NetEnt and others. These games are tested by iTech Labs, so there are no cheats here – the random number generators are truly random. You won’t be cheated here, that’s a fact. How many games does this casino offer? The number of games isn’t the best side of this casino. There are only 90 of them here – it’s not the best number, let’s be honest. The top casinos offer 200, 400 and even 600 games for their customers, and these numbers make Karamba look bad. However, there are some interesting games you will barely find in the other casinos. Unlike the other platforms, Karamba is focused on scratch cards mainly – if you are a scratch card lover, you will love this website, we are sure. The assortment of slots is good here, too. You can choose among 3 and 5 reel slot machines. As for the table games – well, the other casinos offer better assortment. Here you can play roulette and blackjack, but different kinds of poker and baccarat aren’t available here. Another bad thing is that there are no live games here. We are sure that it’s the best way to understand and to feel the atmosphere of the real casino, so an online casino without real dealers is not the best choice in 2017. Maybe they will fix this problem? We hope they will. Is support service good here? The support team works 24/7. You can contact then with the live chat, email or phone – they answer quickly and friendly, and you have great chances to have your problem solved, because the support agents are professionals here. According to the Karamba casino reviews, there are no copypaste answers and no poor English here, like in some other casinos. And it’s great. Sunshine and butterflies, isn’t it? But some dark clouds are here, too. Thus, sometimes the clients complain that the support agents answer for too long (up to 2 days) via email, and some other tiny problems were mentioned. Still, the support team is good here – not the best one, but still good. Are there any problems with the withdrawal? According to the Karamba official information, the withdrawals take no more than 24 hours if you use your electronic wallet, no more than 5 days if you use your card and the same period for those who withdraw their funds to the bank accounts. However, it’s not always the case. According to some of the Karamba online casino reviews and feedbacks, sometimes the pending time is very long (up to 48 hours), and the verification process is long, too. What we can say is that it’s a common problem for all casinos (well, almost all of them), and Karamba isn’t an exception. If you play in casinos, you should be ready to some withdrawal problems, it’s the sad truth. 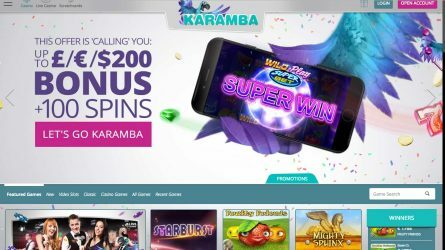 As for the bonuses, Karamba offers a standard welcome bonus (up to 100% of your first deposit, but no more than $200) and free spins (100 free spins, only 20 of them are available when you make the first payment). The wagering requirements aren’t high – unlike the other casinos that force you to wager the bonus for 50 times and more, in Karamba you’ll have to do it 35 times. If it’s done, you can cash your winnings out. The trick is: the majority of the slots contribute 50% of wagering when you play with your bonuses. That’s how a 35x wagering requirements turn into 70x – and it’s a bad result. Moreover, it becomes even worse because the casino doesn’t tell you about these requirements and limits. Of course, all these things are written in the bonus terms, but we are still sure that there’s something of cheating in such a bonus. Read the bonus terms carefully and don’t believe everything you see in the commercials. Talking about the restrictions – well, it makes no sense to list them all here, because this list would be very long. There are more than 80 countries and territories in the restricted list – you can find the United States of America, Australia, Brazil, France, Portugal, Turkey and some other countries in this list. Interesting fact: this casino doesn’t allow to play if you use proxies or VPN. Well, that’s their business – but other casinos, which aren’t allowed in the USA and other big countries with many players don’t usually block VPN and proxies.